You must sign into your myHangout account in order to contact stevenalc. stevenalc's friends list is empty. Guitar, banjo, piano, organ. Just by ear. Banjo Ben Clark, Steve Martin, The Dirt Band, Allison Krauss, Tommy Emmanuel, Earl Scruggs, Doc Watson, Chet Atkins, etc. I am a retired postal employee now driving a big rig as a second career. Love the job, travel and freedom of the road. I used to play banjo many years ago. I got fairly good at Scruggs style picking but let it go due to life getting in the way. I found out it is not like riding a bike. I have picked up a Deering Goodtime open back after searching for a good entry level banjo. I would love to have a Deluxe or something similar but need to make sure I am going to hang with this before spending too deep. I like the little Deering. I have purchased a mute for it from Mikes Banjo Mute. I am a team driver so I have a codriver in the truck with me at all times. Needless to say, learning the banjo in a situation like mine is a challenge at best. My codriver is like a brother and we have learned to accommodate each other without too much drama. 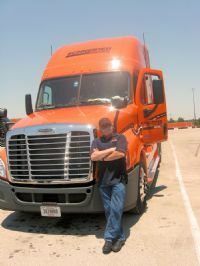 I am about to lose my codriver who is going to team with his son but I have a girlfriend that is working toward her CDL and we plan to team if she passes the muster. She has indicated a desire to learn guitar so we may just have a little 18 wheel music box rolling down the road. I look forward to getting back into the banjo. I enjoyed it a great deal when I played before.